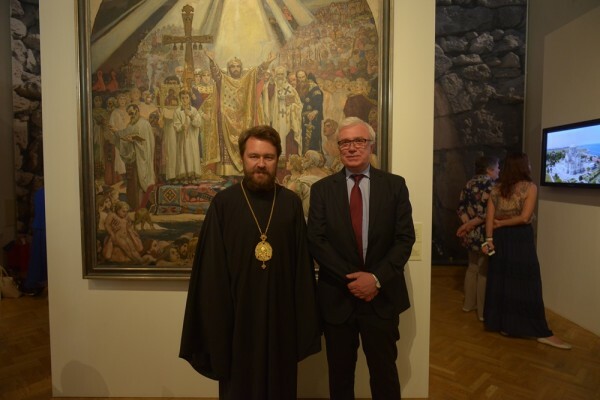 On June 23, 2015, Metropolitan Hilarion of Volokolamsk, head of the Moscow Patriarchate’s department for external church relations (DECR), attended the opening of an exhibition ‘The Baptizer of Rus’. Towards the 1000th Anniversary of the Demise of the Holy Prince Vladimir Equal-to-the-Apostles’. Among those present were Metropolitan Korniliy of Moscow and All Russia, Orthodox Old-Belief Church, Bulgarian Ambassador to Russia Bojko Kocev and O. Yefimov, executive secretary of the State Duma inter-faction group for defence of Christian values. Among the speakers were prominent cultural figures, benefactors and scholars. Metropolitan Hilarion, speaking on behalf of His Holiness Patriarch Kirill of Moscow and All Russia, said in particular, ‘The name of St. Vladimir is associated with the development of Russia as a state, the development of the spiritual space called Holy Rus’, which goes beyond the present Russian Federation to embrace a multitude of peoples living in various countries of the world’. It is difficult to imagine, he said, what Russia’s and the Slavic people’s fate would be if it were not for the historic choice made by St. Vladimir. ‘We know from works of scholars and historians that for Prince Vladimir, Christianity was to a considerable extent also a political choice, as he realized that Rus’ as a state could not develop without a solid spiritual foundation’. Metropolitan Hilarion stressed that Prince Vladimir’s turning from a heathen into a good Christian directly affected the life of all the people, who moved out of the darkness of heathenism and idolatry into the light of Christian faith and Christian enlightenment. ‘For over a millennium both the state and the Church, except for the period when the Church was persecuted under the atheistic power, have built our spiritual culture and spiritual community which unites to this day not only our Russian people but also many other nations’. In conclusion, His Eminence said, ‘Celebrating this significant date, we first of all pay tribute to the wisdom and insight of the great prince who has entered not only the history of Rus’ but also the history of the Russian Orthodox Church as a saint and prince equal-to-the-Apostles. It is a very lofty rank conferred on few saints in the history of the Church’. The exhibition has been prepared by the State Museum of History together with a whole number of other organizations and with the direct participation of the Russian Orthodox Church.